You are a sole proprietor and you do have to do most of your work alone? Bookkeeping only takes your valuable time? 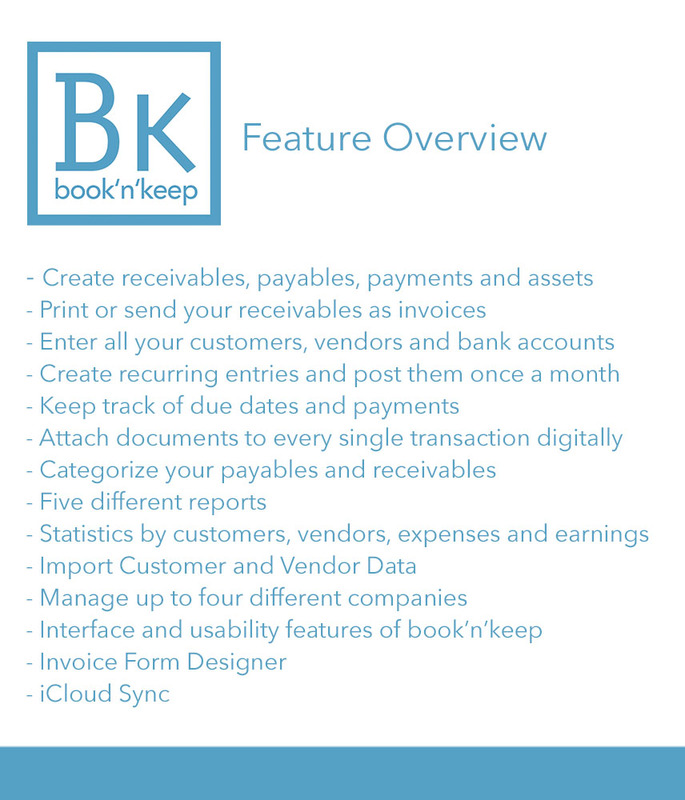 book’n’keep is made to fit the needs of sole traders or small companies that do not have strict bookkeeping rules like double entry accounting but still need to take care what goes in and out. 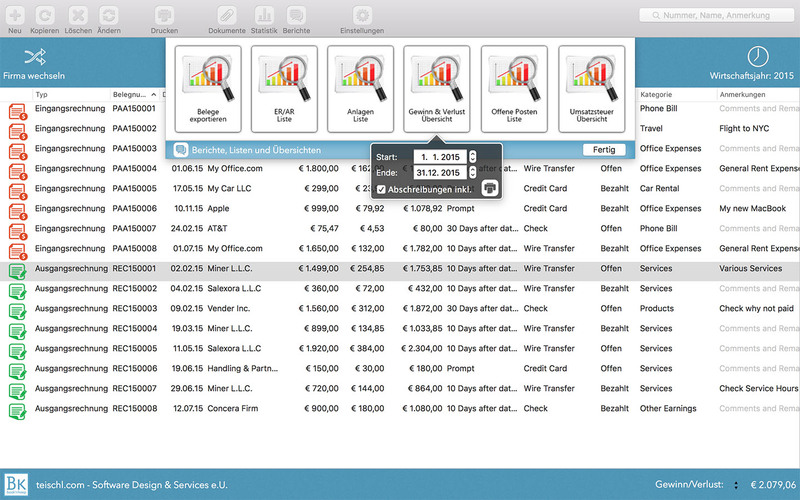 Furthermore you have the ability to manage your books anytime from everywhere with iCloud sync between your Macs! Check out the feature overview right away! Our software combines all data into one place, basic customer data as well as payables, receivables and assets. No nasty paperwork anymore! 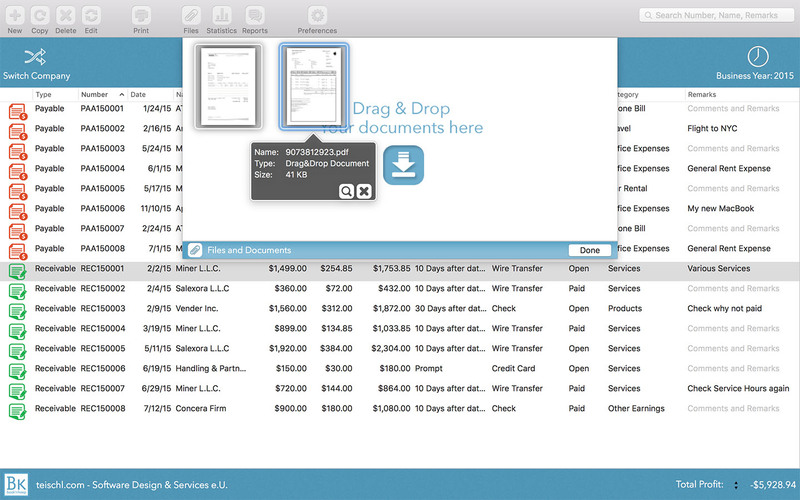 Create PDF Invoices & attach documents directly to your transactions, that saves you a lot of time! On the spot reports and overview information about your company! Simply snyc between your Macs with iCloud, anytime anywhere! 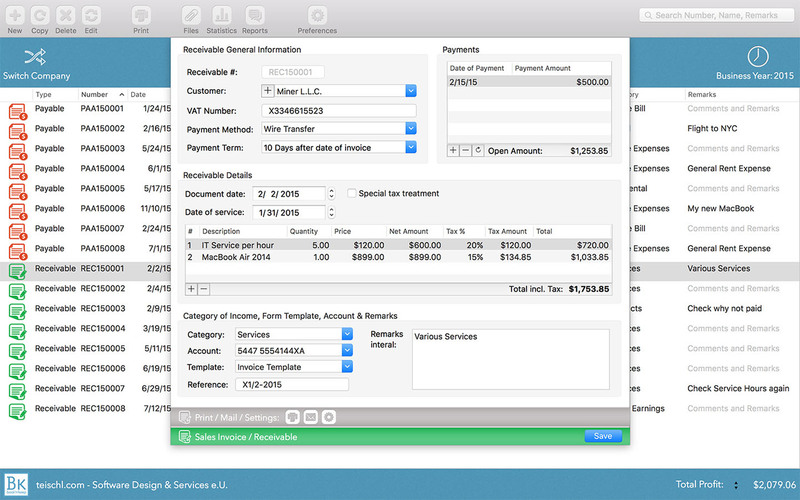 Easy creation of invoice templates! Print different reports, send a proft & loss overview to your tax advisor or do your VAT Reports. Where can I order book'n'keep? book'n'keep is only available on the Mac App Store! How many transactions are supported? How do I attach documents to transactions? You can simply attach documents by dragging them on to the transaction's record or in the documents window. My profit and loss report is not printing, what can I do? Please check in your master files if you have empty lines in Expense and/or Income categories, that sometimes causes problems. 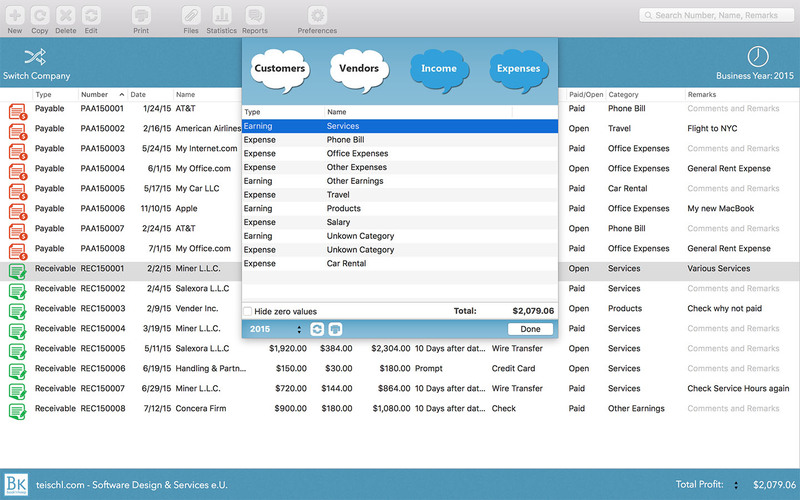 Can I create my own invoice templates with book'n'keep? Absolutely! 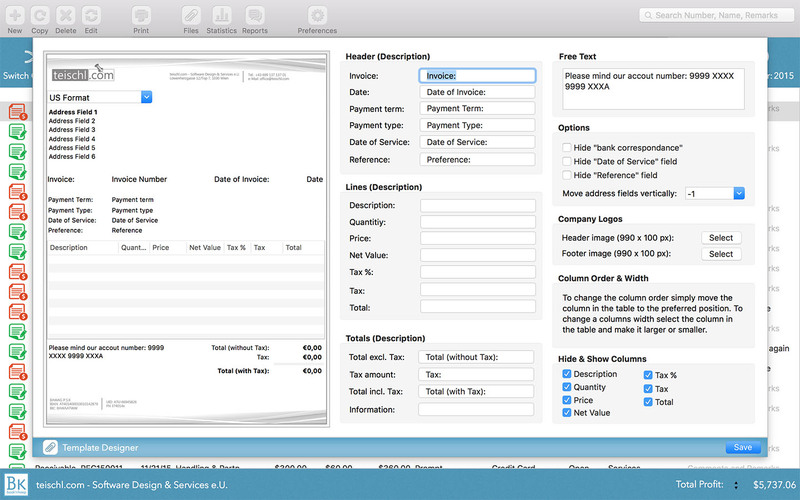 You have an template designer that helps you to create your personalized invoice format! Check the Backups within the book'n'keep Preferences. 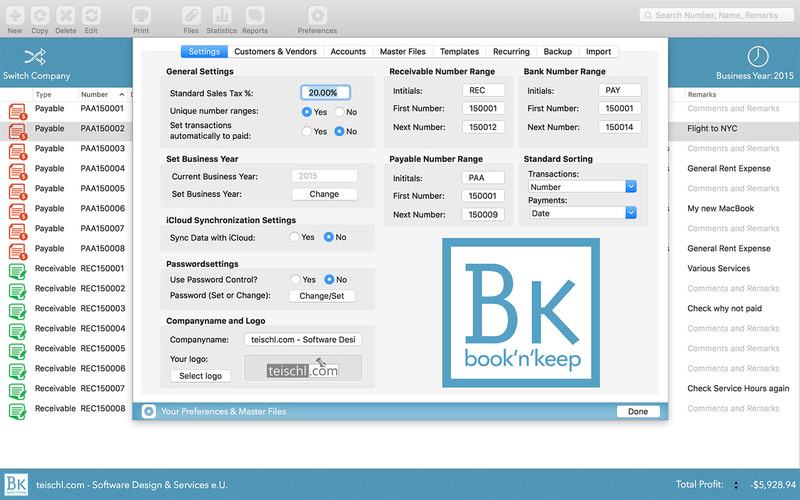 book'n'keep creates Backups fully automatical every time you start the app. To restore a Backup open book'n'keep, click on Preferences -> Backup, select the Backup you want to restore and well..click on "Restore"
Download your free trial version of book'n'keep! it is a little limited (you can only create three transactions) but should give you a good overview. You like book'n'keep but you have a few more questions? That's great! Send us an email and we will get back to within the next few business days!